Do you remember Airwolf? Do you remember Stringfellow Hawke, the eagle's cry, a lone mournful bit of music on the cello? 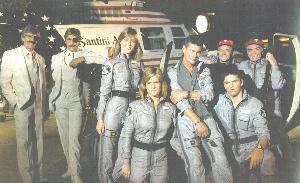 Do you remember a feisty Italian by the name of Dominic Santini, his semi-successful flight school/air company? How about a spunky, troublemaking Texas helicopter pilot named Caitlyn O'Shaunessy? What about Michael Colesmith-Briggs the Third, the infamous Archangel, and his angels? Yes, I'm still in the process of moving the site. Nope, no fanfic for this one yet. Working on it though.